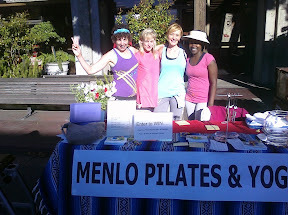 Our local annual downtown block party was held last night, and it was my first time representing a client--in this case, Menlo Pilates and Yoga. While I'd had experience doing trade shows before, outdoor block parties are different in several ways. For one thing, they are more casual, and I found in working the table, that people wanted to take their time and shmooze a bit more. Just like at trade shows, they are looking for goodies to take home, and they want to connect a business with a face. 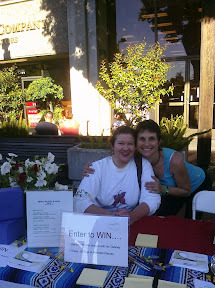 They are also quite willing to provide their e-mail address for a chance at a giveaway. That means thinking through the relevant sales information you need to have readily available as people walk by, and make sure you have sufficient quantities. In our case, this consisted of postcards that had the studio contact info as well as social media profiles; current schedule; fun goodies like zumba bracelets; and "props," such as yoga blocks, a blanket, and a pilates machine. You should also include a promotional flyer or offer just for that event, so you can capture the momentum of the event. It may seem obvious, but don't forget about your sign identifying your business name. You can get large type signs printed at Kinko's or any business supply shop. Keep in mind that it can be windy out, so be sure all your flyers and papers are anchored down. Make sure you get mileage out of your event by taking plenty of photos and videos of any number of activities, such as your staff interacting with potential customers, prizewinners, demos, etc. You'll find infinite uses for these later-- not only for social media updates on Facebook, Twitter, and YouTube, but for your blog if you have one, your e-newsletter, and for future promotional materials like brochures and ads. There's no better way for the public to get a taste of your business than by showing a live preview. In our case, we held a live zumba dance demo, and it was a great success, not only attracting previous class participants who were already fans, but attracting new clients along the way. After the zumba demo, people rushed to the table to grab schedules and other info! A large outdoor gathering is a great way to increase your list and gather hot prospects quickly. You can do a straightforward list sign-up, or combine it with a special offer, like a free class, as we did. You can request detailed information, but the process is much easier if you keep it simple: first and last name, e-mail address, and phone number and street address optional. Let people know (preferably through a sign on the table) how and when the winner will be selected, and if they need to be present to win. Have a variety of items ready for purchase right away, such as water bottles, t-shirts, mugs, etc. Make sure the price of your items is clearly marked, and that those handling the selling are familiar and comfortable with the process. Keep plenty of change and a variety of bills on hand, and be ready for credit card purchases if you are going to accept them. Offer a show special or discount for a group of classes, and make sure there is a limited window for users to take advantage of the offer, so as to create immediacy. *Do not block your display table! It's easy to get caught up in networking, and forget logistical issues, but this one is key. If you block your table, you are physically cutting off potential prospects and customers. Try standing on the side so you aren't blocking traffic. *Don't offer something for nothing. I'm a big believer in lists, and that everyday you should be growing your list. Make sure if you have a giveaway, you get sign up names at the very least. *Don't only speak to one person. Sometimes, imdividuals can dominate the discussion, while others feel left out of the loop. I attended a trade show recently where an exhibitor spent nearly half an hour explaining his program to just one person, while the rest of us sat and waited, and eventually gave up. Are there any other Do's and Don'ts? Do you have a successful event marketing experience to share? Comment here! Outdoor trade shows are much better than its indoor counterpart, but requires about the same things- a banner, tarpaulin, or a simple poster to attract your audience.